Is a San Andreas volcano possible? This question is, in part, inspired from the 1997 Hollywood movie Volcano, where a fictional volcano erupted out of the La Brea Tar Pits in Los Angeles. A transform fault is a special variety of strike-slip fault that accommodates relative horizontal slip between other tectonic elements, such as oceanic crustal plates. 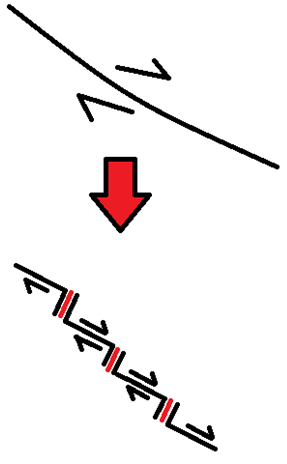 In addition to the regular strike-slip motion observed at transform boundaries, an oblique extensional component is present, resulting in motion of the plates that is not parallel to the plate boundary. Is there any evidence that oblique tectonic movement occurs along the San Andreas Fault? Hence, is a San Andreas volcano possible? Yes. In fact there are already volcanos associated with the San Andreas fault system. Neenach is an extinct Miocene volcano split in half by the San Andreas fault. Garry Hayes wrote a nice blog post about this volcano system: A Volcano Sundered: A Field Trip Along the San Andreas Fault. The Space Shuttle photo (left) of the Imperial Valley annotated by the USGS shows the relationship between the San Andreas fault, about 5 km from the volcanos, the Brawley Seismic Zone (BSZ), and the Imperial Fault to the south. At this scale, it's essentially one big fault system. Why would volcano eruption cause cardiac arrest? Olympus Mons sized volcano on Earth? If I can drill a hole to mantle, does it form a volcano? What drove the Puy de Dôme volcano? Is San Andreas fault horizontal or vertical? Are there lava flows inside a volcano?